Standing 30 foot tall, the pylon now has a thick blanket of dust and mud, the surroundings being in even more deplorable condition. Hyderabad: This is a memorial that no one remembers. This memorial, adjacent to the Victory playground in Chaderghat, stands as a monument of irony in more than one way. One, because this is the 100th year after the World War I, after which the memorial was built as a tribute to Indian soldiers who fought and became martyrs in the War, and then, because, for the last several years, despite several media reports on the pathetic condition of the memorial, authorities have conveniently forgot it. It was on November 11, 1918, that World War I came to an end with Germany being forced to seek an armistice. And on Sunday, as the day marks the centenary of the memory, people around have forgotten what it was erected for. The inscriptions on the pylon too have faded away. One needs to strain the eye to understand what the inscription says: “This monument was erected by the inhabitants of the Residency Bazaars, Hyderabad in grateful memory of our sailors and soldiers who gave their lives in the great war 1914-1918 and of the peace which crowned the sacrifices of Great Britain in the cause of freedom and righteous”. Standing 30 foot tall, the pylon now has a thick blanket of dust and mud, the surroundings being in even more deplorable condition. There are people who relieve themselves near the pylon, not to forget those who dump leftover food and garbage all around it. The sickening stench near the pylon tops it all. Heritage lovers point out that no efforts are on to restore the pylon to its golden days when there used to be meetings near it, and VIPs or Armymen visiting it. 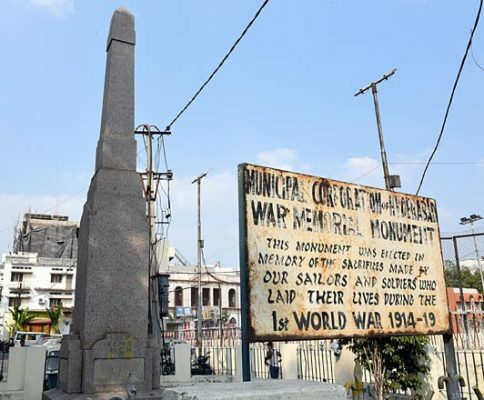 City-based historian Anuradha Reddy says the situation of the pylon shows that there is no value for the soldiers who sacrificed their lives during the War. “I recently visited the place. The stench and the condition of the surroundings have made it an eyesore,” she says.